Granola has always been one of my go-to meals for breakfast. I love that I can mix it in with yogurt, serve it with warm fruit or make it into bar form. It’s also pretty healthy and keeps you full, so I can’ complain on that front. When I saw this recipe on Nicole’s blog, Prevention RD, my immediate thought was “Those flavors sound good together!”. It turned out the weekend I wanted to make these, I also had planned on making smoothies for snacks during the week. I usually toss at least half a banana into the smoothie. Since this recipe also calls for bananas, I was able to take advantage of the bundles of 8 large bananas at the farmers market for $1. 1. Preheat the oven to 350. Spread oats and pecans out on a large baking sheet. Bake for 10-12 minutes, tossing occasionally until the are lightly toasted. 2. Line a 9×11 baking dish with parchment paper that hangs over the sides of the dish. 3. In a large bowl, mash the banana with a fork. Add the remaining ingredients and stir to combine. Then fold in the oats and pecans. 4. Scoop into the parchment lined baking dish and press down to make the mixture even. Bake for 50-55 minutes or until the granola is a light golden brown. 5. Transfer to a wire rack and cool for 15-20 minutes. 6. Use the parchment paper hanging over the dish to lift the granola bars out of the dish. Return to the wire rack and let cool competely. I had to make a few slight adjustments to this recipe because I realized that I didn’t have an extra roll of parchment paper in the pantry like I thought I did. In the original recipe the parchment is used on the baking sheet and the bars are cooked there, not in a baking dish. Since the piece of parchment I had wasn’t large enough to cover the baking sheet with any overhang, I opted to use a baking dish and increase the baking time by 15 minutes since my bars were much thicker. 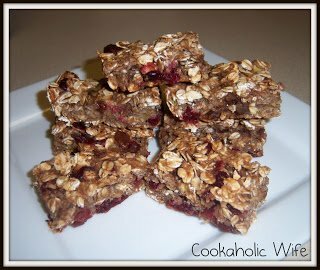 If you’re hesitant to make your own granola bars and still prefer the store-bought type, I highly suggest you get your behind into the kitchen and make these. I’m sure they’ll change your mind. The soft chewiness from the banana and applesauce is something you’ll never find in a store-bought kind, even the ones that say they’re chewy. And the best part, is if you can cut them better than I did and end up with 15 instead of 18 evenly sized bars, Nicole lists the calories at 157!